My personal friends sometimes ask me if I become friends with any other food bloggers. I would reply yes and typically they follow up with the question if I have met any of them in person. The answer is yes, I got to meet up with Kay from My Home Cooked Meals twice when she visited SF this year. And yesterday, I was also fortunate to meet two new food blogger friends in person, Elisabeth from Food and Thrifts and Joanna of Chic & Gorgeous Treats. Elisabeth flew in from Florida and Joanna from Malaysia to attend the 2011 Foodbuzz Blogger Festival. I only had a few hours to spend while my children were in school but I had such a lovely time with two ladies in a tiny French pastry shop. I was in a such a hurry that I didn’t bring my camera so no photos to share…Sorry! It was a first time meeting them in person, but we kept talking about food, blogging, the festival, and 2 hours went by really quick. I had to run back to get my kids from school or else I wish I could have spend more time with them. Now let’s talk about food. One of readers in Singapore told me Sanma (Pacific Saury) is still in season and it’s pretty cheap there (about $4 for 2 whole Sanma in the US). 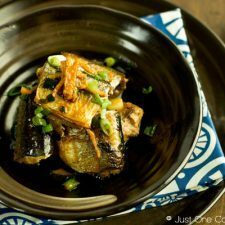 So today I’m sharing one more Sanma recipe. 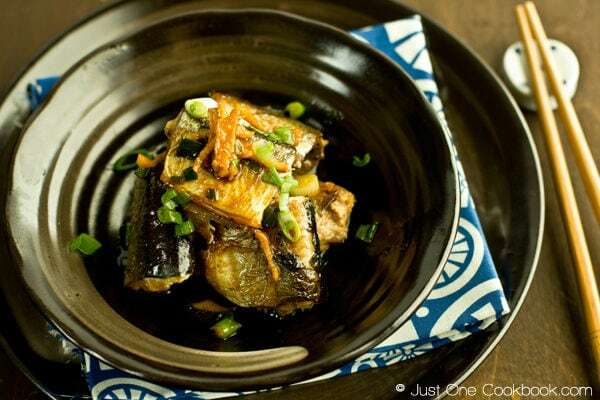 Please check my other Sanma recipe, Sanma Shioyaki, if you haven’t seen it yet. Classic Japanese fall recipe, pan fried Sanma Teriyaki (pacific saury) dressed in homemade teriyaki sauce, with ginger, sake, mirin, and soy sauce. With a sharp knife cut the abdomen of the fish into the flesh to open it up. Scrape out the guts and discard. Rinse under cold water to clean and remove any traces of blood. Cut into 2 inch piece. Sprinkle Konbucha and salt and set aside for 10 minutes. In a non-stick frying pan, heat oil on medium high heat. Add the fish and cook both sides. 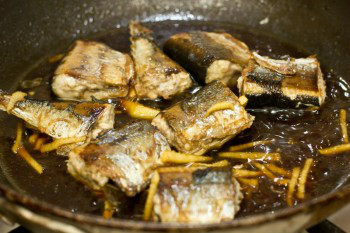 When the fish is cooked, wipe off extra oil on the frying pan. Add the seasonings. Shake the frying pan and coat the fish well with the sauce. When the sauce gets thicken, add green onion. Shake the frying to mix. Serve the fish on a plate and pour the sauce over. Serve immediately. I have never tried Sanma but looks lie a firm fish that is nice to eat! this is something my husband would love! How fun to meet up!! What an elegant dish this is! I meant to tell you in my last comment that it’s nice to know that teriyaki is the method of cooking rather than the sauce. Until your post, I always thought it was just a sauce. This fish looks really great. 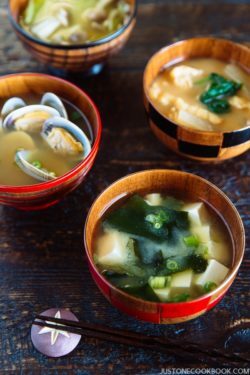 I haven’t seen that type of fish here, but there are a few smaller local kinds of fish that I would like to try this method of cooking with. I see that this time you left the head off as well 🙂 Great post! This is delightful! I like how easy it is to prepare. Thanks Nami! Nami, thank you for the mention! I just had grilled sanma for dinner when I read this post, what a funny coincidence 😀 I have never tried konbucha before and you made me want to go get it from the store now. This looks quick and easy to prepare and my husband would build a statue in my honor if I made this. I am so looking forward to Friday to see what sweet treat you make! 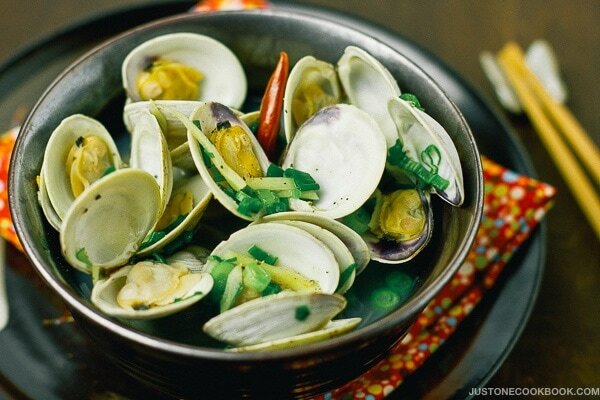 This really looks heavenly Nami, so tasty and beautifully presented. I love all the flavors together. I’ve never tried this fish before but will check it out next time I’m at the Asian market or would I be able to find it at the seafood market as well? Nami, I still remember Arudhi’s recipe! I have promised myself I will prepare it even if I don’t find exactly the same fish. 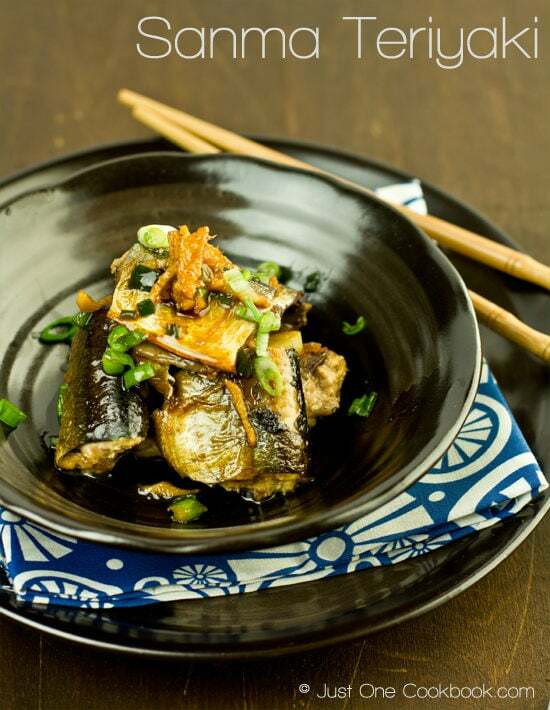 Your sanma teriyaki looks beautiful and luscious! It makes me want to run and buy any fish and do it for tonight’s dinner. Another simple fish dish, I gotta get some Sanma the next time we head to Super H Mart! Oh it’s so wonderful to hear you are meeting food blogger friends in real life, I know the next time we head to SF it will be so exciting to meet you and your whole family! Hello Nami, Me too, I thought that teryaki is the sauce and not the method.. Good to know the real deal! Now about the fish, never had Sanma, it looks like mackerel.. but I want to tell you that yesterday I made my first teryaki dish with shrimps and vegetables.. It was so easy to make and so delicious! i got the idea from your Beef Teryaki..
Oh, and another thing, I visited babbles to vote for you and I saw that your blog is so high ranked! Congratulations Nami, you really deserve it! That sounds like fun to meet food bloggers, especially those that you get to know through blogs and then finally meet in person. How awesome that you got to meet Elisabeth and Joanna…I can imagine how much fun three of you had!!! 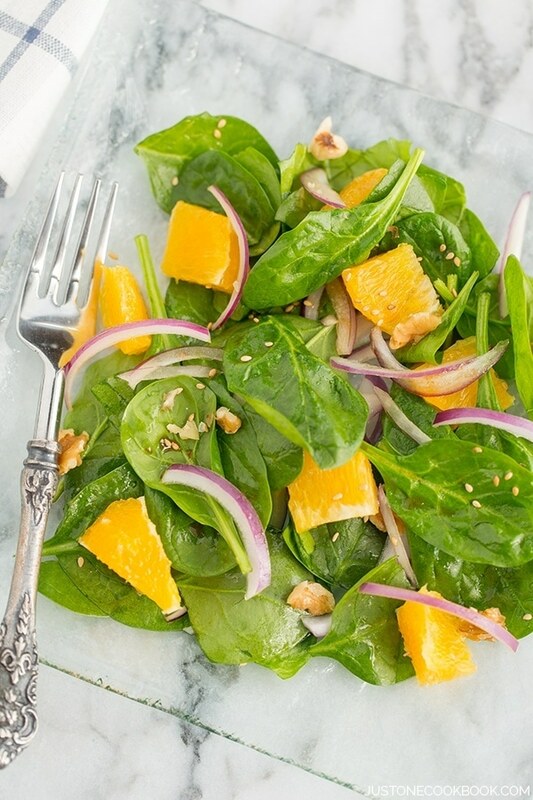 Your recipe today look so fantastic, love fish recipes! Lovely photos, Nami!!!! PS: Would it be tasty if I use other types of fish? Which other type would you recommend? I love meeting up with blogger friends near and far. It’s a great thing about this community of friends. This dish sounds so delicious. I love the seasonings as always. You are so adventurous with the whole fish, I haven’t gotten that brave yet! This looks so delicious! Today for Mouth-Watering Wordless Wednesday I posted my Spicy Teriyaki Salmon with Scallions & Brown Rice. OH man, I could eat 4 bowls of that right this second. It looks sensational! Definitely something I would really like. You know that I like fish, don’t you Nami? I am not familiar with this fish but have eaten something like this in a Japanese restaurant ( it’s called pike, don’t know if it’s the same). I can just imagine how that tastes with Japanese rice. I have always thought that teriyaki is the name of the brownish sauce which always contains soy sauce, mirin, sake and sugar. What an enlightenment to know that it’s actually simply a cooking technique! I have to admit I am not a real fish lover, but I would have this dish anytime! It looks so delicious! We are really getting quite the lesson on teriyaki, I love it. And I am not sure if I have had it in a fish recipe, will have to try. Yes meeting other food bloggers is the best, especially when someone is from out of town. And the flavors in this dish sound marvelous! I don’t think I could get my family to eat it, but I’d jump at the chance 🙂 Your top photo is perfect. Hope you will give scones a try…I know you will love them! This looks really good Nami but I’m sure you know what I’m thinking 🙂 – Sanma Shioyaki coz I have a soft spot for that! BTW, the saba shioyaki turned out well, the only thing is I will need to place it on a elevated grill before grilling it next time to prevent the fish from cooking in its own juices, but still, it was yummy and could have been a little more dry like the restaurants. So mouthwatering! I love the “fishy” fish prepared like this. So flavorful. I’ve never had this fish, but I love anything Teriyaki! Your fish looks fantastic Nami! Nami – I’m SO glad you got to meet other food bloggers! Would you believe – I just finished CHATTING with Joanna on-line. She’s awesome! Oh nami! Your fish looks fabulous! I love the step by step pictures! The first picture is just perfect! oh…Great Nami u meet some blogger friend personally it’s great. This fish dish looks really nice. Learned something new here-teriyaki as a cooking method. Funny how some things get twisted around. The final plating does look delicious and I am sure it tastes amazing. When I see these type of dishes I long to be on the coast-fresh fish is hard to come by here. I have always wanted to meet fellow bloggers in person and that is why I am seriously considering the festival for next year. Have a great day! 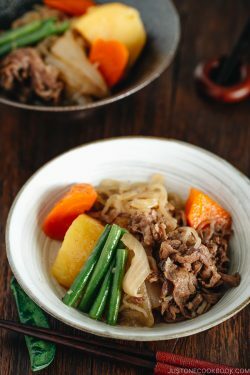 whats Konbucha and mirin? 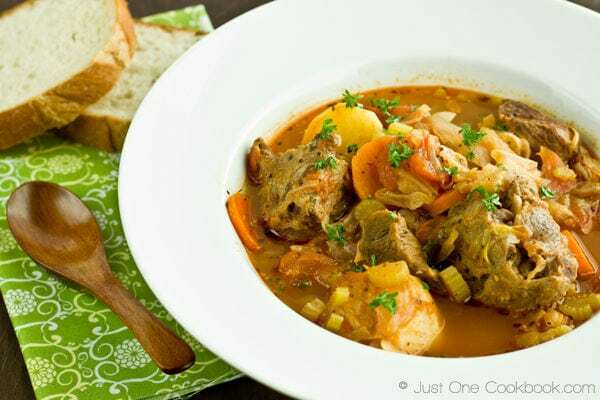 I realy wanna try out this dish, my husband would love it. Konbucha and mirin are both Japanese condiments. 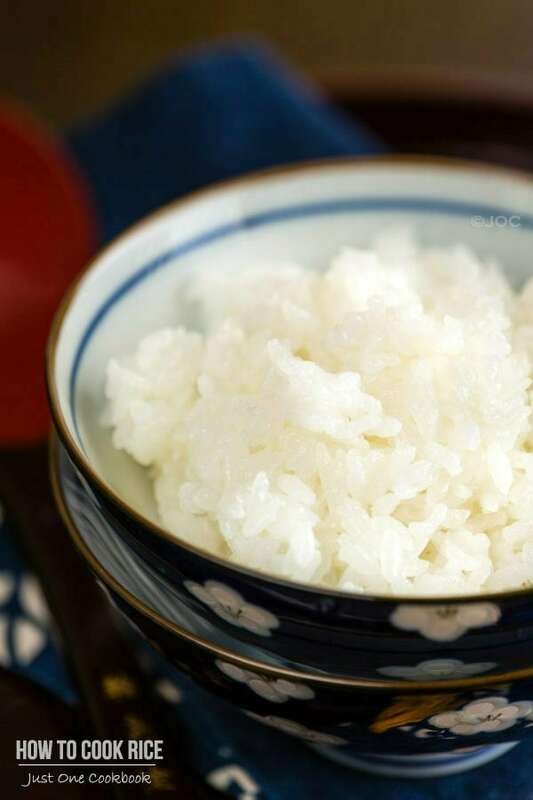 Mirin is one of the important condiments for Japanese cooking. Konbucha is made of seaweed (konbu), which is used for drink or seasonings. That is so great that you got to meet some blogger friends in person! I’ve never had sanma teriyaka but it looks delicious. Thank you for introducing me to more new food! This looks gorgeous Nami! I’ve never tried sanma but looking at your pictures I would love to one day! I did not make it for the Foodbuzz Festival due to the dampening weather and how it may impact my recovery (also I did not want to put on a sling around my arm in crowds…) but I am glad you met up with some blogger friends. Hey, you alwasys carry iPhone that has a very nice camera!!!!! Sounds like you had a great time at the Foodbuzz conf. wish i could have gone :). Awesome dish – again starving now. Must have been nice to meet your blogging friends in person. I would love to meet you in person one day too. 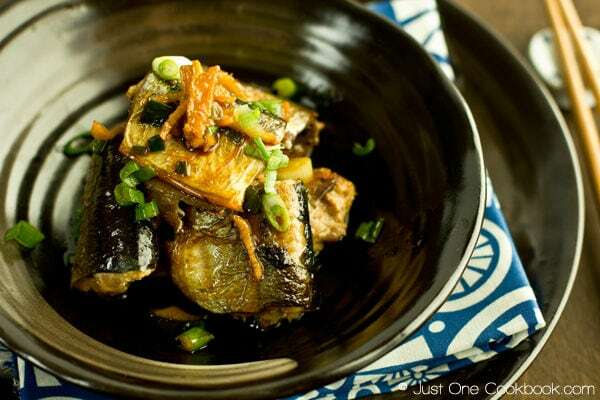 This saury dish is so simple and yet sounds so tasty. I have tried the Sanma in both shioyaki and teriyaki style, and loved them. Looking at your post makes me wanna go for a Japanese meal now…. I could eat this fish with lots of rice, Nami! I love how you used the dark bowl because It compliments the rustic color of the fish. Very good job, Nami! Nami, thank you for mentioning me in your blog:-). That is so great that you got to meet more bloggers in person! I think it is so cool when you get to meet up with fellow bloggers in person. You live in a good area for people to visit. I can’t wait until I get a chance to visit you 🙂 This dish look lovely I really enjoy your photos. Uh oh. Here I sit writing my first teriyaki chicken post and now I find out that teriyaki isn’t really the accurate name for the sauce. :/ I was actually proud of making a teriyaki sauce and I’m guessing it wouldn’t truly qualify as Japanese food at all, would it? Oh this looks really really good Nami…. 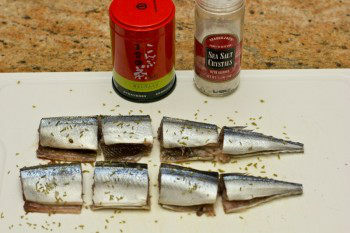 I’ve never tried Sanma – it reminds me a little bit of Sardine though… is it similar? It looks like a nice neat little fish though – fun and tidy to cook with. You know, though, I’ve never gutted a fish in my entire life. If I ever buy fish, the guy at the stall or fish-counter will always ask if I want it “vidé” (gutted, in French) and I always almost scream “yessssss!”. It kind of grosses me out a bit 🙁 Presumably gutting at the point of sale is quite a world-wide thing though, at least in the west – are there any advantages to gutting it yourself at home? Just curious why you’d want to put yourself through the trauma! I know, it probably sounds very silly and for most people it’s probably not a big deal – I guess I just need to try it a few times myself and stop being so damn fussy about it! Nowadays in Japan, all the fish in supermarket is prepackaged (fillet or whole fish). 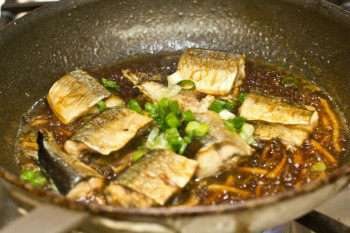 Sanma is famous for cooking the whole fish without intestine intact. So they sell the fish with gut and people enjoy the bitter taste of it (sounds scary to most of my readers I think??). So I had to remove the gut on my own. Most people in Japan know or learn how to gut fish. I think that’s how we’ve been doing through generations… when I was small there were fish stores, but I don’t remember if they clean the fish for customer. Now those small fish/meat/vegetable stores are all gone in big city, replaced by supermarkets and everything is packaged. Although it’s very common for us to clean fish, I’ve never seen the whole chicken sold in supermarket in Japan and never knew how to prepare whole chicken until I came to the US. So…I think it’s cultural difference? Oh, I know I would love this. Glad you showed the whole fish photo. What a great way of making fish. It looks wonderful. This is beautiful Nami. I love fish but rarely make it. It intimidates me a little bit. Glad I stopped by to see you make such a lovely dish. Motivates me to step outside my comfort zone. I love sanma, especially as sushi. This also sounds delicious. I was wondering if you had any tips for picking the best Sanma at the fish market. I am very excited to try and make this dish but am not familiar with this type of fish at all! I’d appreciate any advice! 1) Pick sanma that is plump (thick?) from head to the back . It’s more oily and delicious. 2) Fish goes bad from the intestine, so pick sanma that has firm stomach. 3) Make sure the area around the black eye is clear and transparent. 4) Old days it is said that yellowish mouth and fin has nice oil, but these days there’s a theory that’s opposite.